.01 I started this 3Q Mel about a week ago. This is my first 3Q kit and happy to have the multi-media parts to it. I added the bolts, rivets, an arm and engine shield and a larger "nuts protector". I saw an engine shield on a Jerry build once and thought it was a good idea s a field add on. 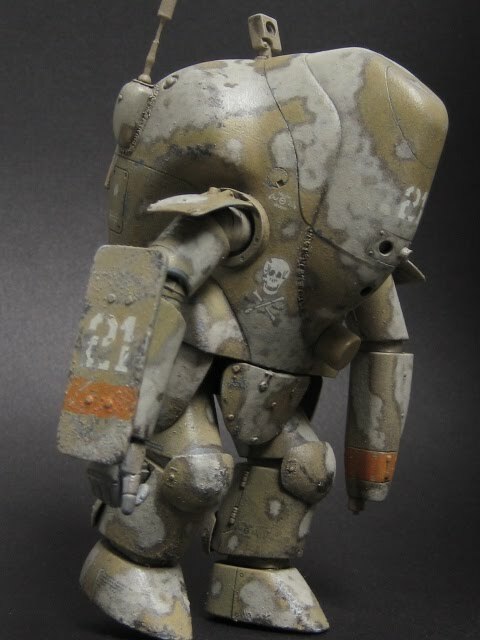 Overall, A quick build I figured I'd just post the painting and weathering portion of it. I am working from the Camo card for this one, something I have not done with past builds. I skipped some of the steps in posting, so I'll just mention what I've done up to now. I primed it with rattle can Testors flat grey primer and didn't like it too much. It smells really bad and sticky to the touch even two days later- at least my can was. 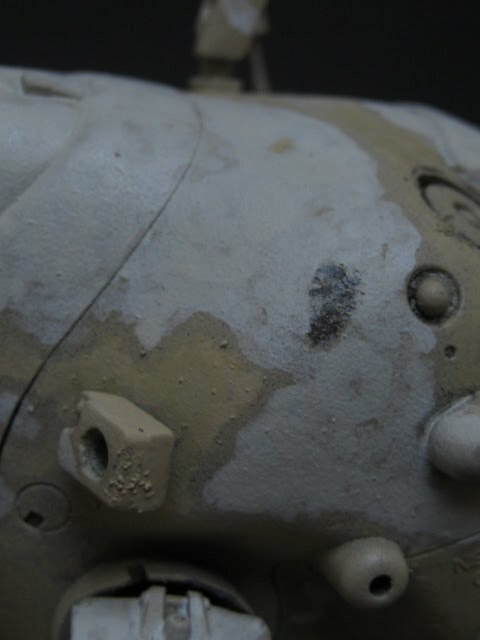 I mixed acrylic Tamiya Flat Red and German Grey to come up with a rusty colour for an under coat hand applying it to the entire suit. Next, and Captain Kirk, I know you told me not too...I used some hair spray and salt in areas to test this out. Never done it before, but always wanted try because the results seem pretty cool on others builds. Because I plan on hand painting the camo, I used sealer after the salt dried to seal the salt and hairspray so when using my brush later, I don't dissolve the salt. I am figure I'll lightly sand the grains and then dissolve them with water later. I then spray painted Tamyia Deck Brown over the suit. Next, I went in with thinned Tamyia flat white to "map" the pattern. I then went back building the white portion up with small painted white circles layered over each other. I then went in with Tamyia desert yellow also thinned and repeated the application as the white leaving a thin line of the deck tan between the white and desert yellow which I layered after with thinned out paynes grey oil point by Winton. Next up are the decals then more chipping. .02 I hit the suit with some green and burnt sienna for the filter. After almost a day of pining over which decals to use, I went with the number set from the Konrad. My intention when I started this Mel was to follow the camo card to the letter the best I can, but the suit asked from me different. While looking around at other Mels and real world military armor to draw inspiration and code direction from, I stopped at BK's site and saw his PKA ausf M Melusine #2. What a great build, with an engine cover AND shield to boot. I want my build, like his to seem a bit heavier then the standard issue Mel. Anyway, where as I thought I had seen the engine cover on a Jerry, it was probably BK's build picked up by osmosis. I used Testor's Glosscoate (rattle can) to get the build ready for the decals. Applied the decals, sealed again with Testors Glosscoate and like on the camo card, I went with the orange ID band. I used Polly Scale Model Railroad Colours, Utility Orange. It goes on nicely, not like I remember Polly Scale paints from when I was a kid. It was easy to chip and flake off too and I like how matte and faded it comes off. 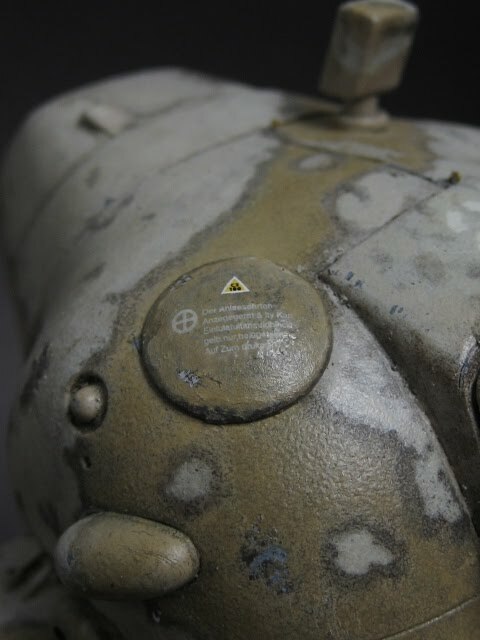 Next up, re-apply boarder on camo pattern, fill in chips where the salt took the base coat away and work more washes and filters. Walter Pezzali's 1/20 Ameise Robotic T/370 "ESEL"